Home Sweet Home is the most distinguished lean-to in East Hampton. The house is believed to have been built in the 1720’s while the parlor paneling is attributed to mid 1700’s. It is a simple, dignified house, unpainted, after the fashion of the best houses of the ancient village, its exterior of rough shingles is bare of all ornamentation except that which the graceful hand of time has lent it. For all its simplicity, the old house seems to realize the dignity of its association with romance and its place in the hearts of men. It has not slouched after the manner of some old houses, but has held itself erect with the bearing of calm firmness. 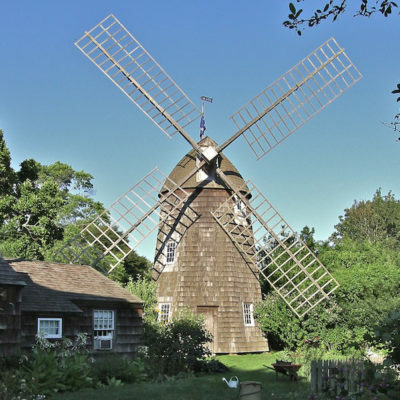 It is situated on the Village Green, the center of Colonial East Hampton. The house, one that has come to embody the spirit of all that is tender and sweet in home, is modestly turned away from Main Street. Home Sweet Home and its contents exude a charm that is understood and felt the moment the visitor steps into the house. The fine 18th and 19th Century antiques, china and lusterware appeal to our aesthetic and practical sensibilities. From 1907 to 1927, Mr. and Mrs. Gustav Buek owned and lived in the house and furnished every room with authentic period pieces as a shrine to John Howard Payne. Upon Mr. Buek’s death, the Village, by referendum, bought the house and the collections and opened Home Sweet Home as a museum on December 15, 1928. 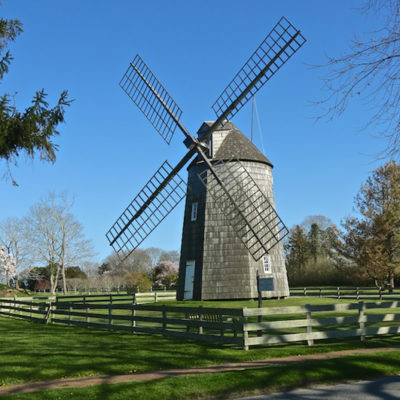 For most of the last century, Americans have regarded windmills as a picturesque remnant of our agrarian beginnings, a pleasant, even romantic aspect of the landscape in certain areas of the Eastern seaboard. But in their earlier life windmills were hard working laborers in the community, applying man’s ingenuity to tasks essential to survival: Grinding grain, sawing wood and pumping water. These structures assumed all tasks which the wind could be applied to do. 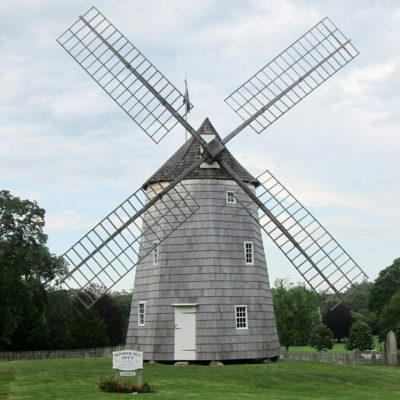 Today in East Hampton, Hook Mill, Pantigo Mill and Gardiners Mill still stand. They represent all the best their sponsors could afford; the best tools their community could provide for the job at hand. They represent some of the oldest and best examples of American craftsmanship in the Wooden Age. A windmill is an intensely practical, and usually very crowded piece of engineering and construction. Moving around inside of one is much like exploring the workings of a giant clock. These mills can be read as testimonials of a native technology. Windmills attract us all because they are survivors of a remarkably different era.